This year’s European Frequency and Time Forum (EFTF) is already the 32nd edition of this conference series and will take place in Torino, Italy, during the upcoming week. This conference is one of the global gathering of researchers involved with the measurement and distribution of time and frequencies; the conference webpage can be found here. Each year, a European Time and Frequency Award is given to an outstanding researcher to recognize his or her work. This year’s EFTF Laureate is Ekkehard Peik (PTB), one of the driving forces behind the nuClock project. He will receive the award “for seminal contributions to single-ion optical frequency standards and high-precision spectroscopy thereby establishing most stringent limits on possible variations of fundamental constants”. Congratulations to Ekkehard for being this year’s EFTF Laureate! The Th-229 nuclear isomer has been around for more than 40 years already, but two of its main properties, namely its energy and lifetime, are known only with very large error margins. While there is no experimental value for the bare isomer lifetime at all, there is at least some consensus on the isomer energy (somewhere between 6.3 and 10 eV). In their recent study (now available on the arXiv preprint server here), the Russian group at MEPhI suggests an energy of 7.1 eV and a lifetime of about half an hour for the bare isomer. These values are in agreement with all recent experiments, which is very good news. And it’s the first time since the Beck et al. measurement (more than 10 years ago !) that a research team dares to put forward a value of the isomer energy. Let’s hope that an independent experiment using a different approach will soon be able to confirm this value. Congratulations to the Russian team for their work! 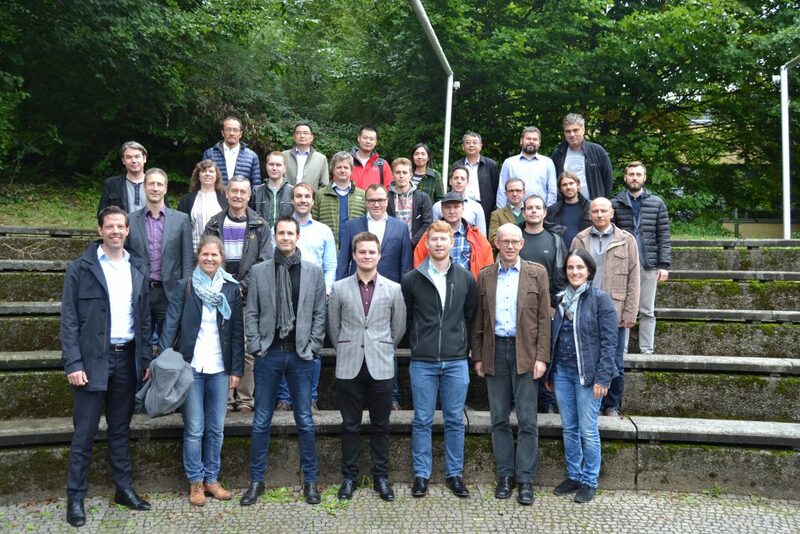 Last week’s 3-day meeting in Heidelberg was a great success. With 33 participants, this was by far the largest nuClock meeting to date (Vienna 2014: 20 participants, Munich 2015: 24, Brussels 2016: 19). Aside from pretty much all the nuClock members, a large crowd of external guests joined the meeting: Koji Yoshimura from Okayama (Japan), Piet van Duppen and Matthias Verlinde from Leuven (Belgium), Nikolay Minkov from Sofia (Bulgaria), Rukang Li, Xiaoyang Wang, Mingjun Xia, and Lijuan Liu from Beijing (China), Mustapha Laatiaoui and Christoph Düllmann from GSI, as well as the local MPIK fellows José Crespo, Sergey Eliseev and Klaus Blaum. A total of 22 talks were given, all of them showing exciting results or new ideas that will be published in the near future. Many thanks to Adriana for hosting the meeting! The next nuClock meeting will take place in Bad Honnef, Germany, on July 9 – 12, 2018. This is going to be a large conference (approx. 100 participants), entitled “WE-Heraeus-Seminar: Novel Optical Clocks in Atoms and Nuclei”. Group photo of the nuClock team 2017. Last row, left to right: Koji Yoshimura (Okayama), Rukang Li, Mingjun Xia, Lijuan Liu, and Xiaoyang Wang (all Chinese Academy of Sciences, Beijing), Przemyslaw Gkowacki and Maksim Okhapkin (both PTB). Third row: Andreas Fleischmann (KIP Heidelberg), Sarina Geldhof and Ilkka Pohjalainen (both Jyvälylä), Piet van Duppen and Matthias Verlinde (both KU Leuven), David-Marcel Meier (PTB), José Crespo (MPIK Heidelberg), Lars von der Wense (LMU Munich), Pavlo Bilous (MPIK Heidelberg). Second row: Jürgen Stuhler (Toptica AG), Peter G. Thirolf and Benedict Seiferle (LMU Munich), Johannes Weitenberg (MPQ Garching), Georgy Kazakov (TU Wien), Iain Moore (Jyväskylä), Nikolay Minov (Sofia). First row: Simon Stellmer (TU Wien), Annkatrin Sommer (Toptica AG), Thorsten Schumm and Kjeld Beeks (TU Wien), Brenden Nickerson (MPIK Heidelberg), Ekkehard Peik (PTB), and Adriana Palffy (MPIK Heidelberg). Not pictured here: Christoph Düllmann (GSI & Mainz). Tunable narrow-linewidth lasers, as required for precision spectroscopy, are available only in the visible and infrared wavelength ranges, but not in the VUV range (below 200 nm). Unfortunately, many of the most important transitions lie in this specific wavelength range: building a laser for the VUV range would allow one to perform spectroscopy on the Lyman-alpha transition in hydrogen (121 nm), on He+ ions (60 nm), on a variety of highly charged ions which are relevant for cosmology, and (of course), the Th-229 nuclear transition. Such lasers build on high-harmonic generation in a gas jet, which is quite an inefficient nonlinear process. As a consequence, lasers with both high average power and high peak power (short pulses) are required. The combination of short pulselength, high repetition rate, and high average power is hard to fulfill. Researchers at MPQ in Garching now made an important step forward: Instead of using Ti:Sa lasers (which are common in the field), they used a pulsed Yb-doped laser at 370 W average power, however with a comparably long pulse length of 860 fs. Using a scheme called multi-pass cell spectral broadening (MPCSB), they were able to shorten the pulse length to 115 fs, which is an increase in peak power by a factor of about 7. The specific laser developed here will be used for spectroscopy of He+ ions, but the technology could also be transferred to a laser system dedicated to Th-229 research. The work has recently been published with Optics Express and can be found here.